Personal Fundraising Pages are individual crowdfunding pages that volunteers, board members, and other supporters can create under a CauseVox campaign site. These pages can be created by individuals looking to raise awareness for nonprofit organizations they work for, causes they support, or social good projects they want to help and promote. By utilizing the power of their own personal networks, personal fundraisers (the people that create a personal fundraising page) can help increase outreach for crowdfunding campaigns and thus augment donation efforts. Let’s take a look at an example of a Personal Fundraising Page. Personal Photo - The default photo here would be the one set up by your main campaign. You can update this section with your own photo or anything else of your liking. Donation Statistics - On the upper right side of your Personal Fundraising Page, you will find the Donation Counter, Impact Metric, Days Remaining Counter and the Donate Button. Some of these options may not appear due to how your CauseVox Admin setup the CauseVox campaign site. The Donation Counter - The Donation Counter keeps a rolling figure of donations collected on your Personal Fundraising Page. The Impact Metric - The Impact Metric acts as a counter to reflect the units of impact donations are creating. This will show the impact of donations in terms 'how many' are helped. Days Remaining Counter - The Days Remaining Counter displays the countdown to your fundraising end date. Your Personal Fundraising Page will continue to collect donations even after your end date has passed. Social Sharing - Right under the Donate Button, you will find a list of platforms where you can share your Personal Fundraising Page. B. My Teams - Right under the Social Sharing section, you can find a list of Teams you have created and/or belong to. C. Fundraising Appeal - Located right under your personal photo, the Fundraising Appeal describes the purpose of your Personal Fundraising Page (i.e. the campaign you are trying to raise support for). Use this section to give your potential supporters a concise and clear idea on why you feel for this campaign, the goal of this campaign, and how it intends to fulfill its goals through these fundraising efforts. Don’t forget to conclude your appeal with a call to action to donate. 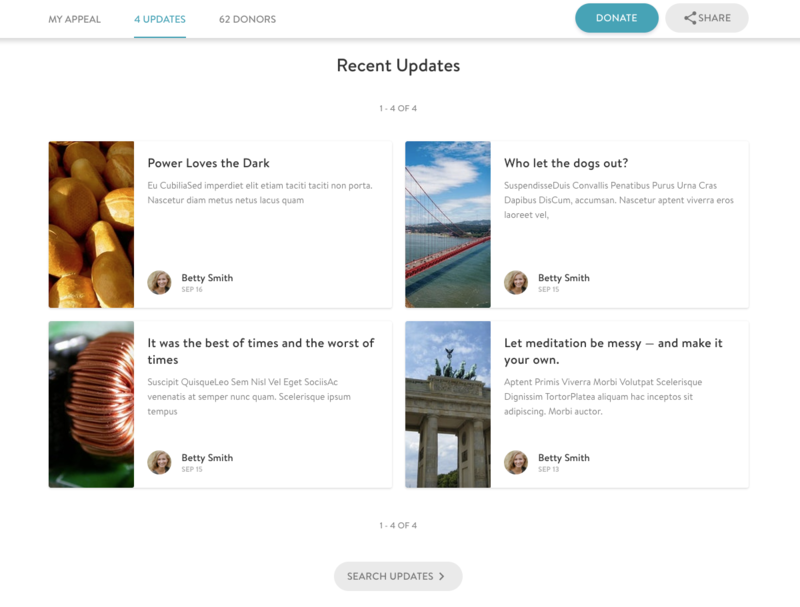 D. Recent Updates - Located right below your Fundraising Appeal, any blog posts you write and publish on your Personal Fundraising Page will appear in the Recent Updates section. 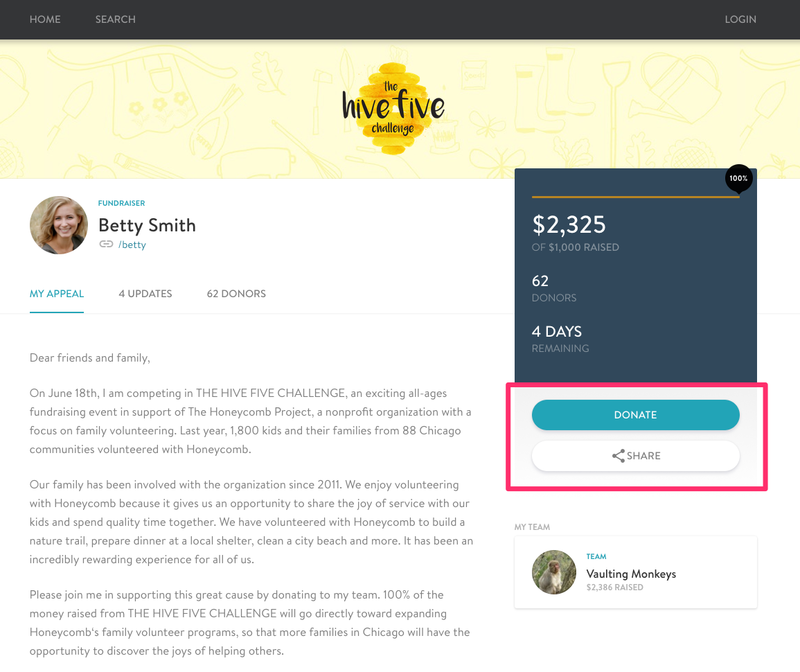 If this feature is not enabled by your CauseVox Admin or should you choose not to publish any blogs, the Recent Updates section will not show up on your Personal Fundraising Page. 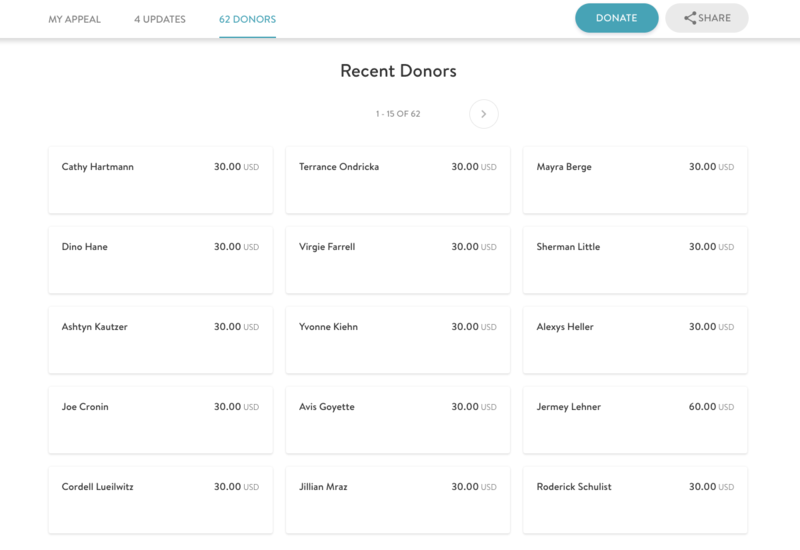 F. Recent Donors List - Right under the Social Sharing options, you can view a list of donors to your Personal Fundraising Page in order of recency of the donations made.